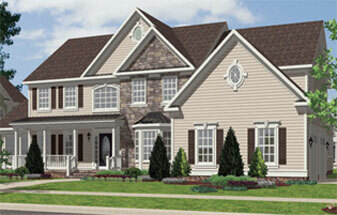 This St. Claire has a well appointed design for all your family requirements. Walk into a beautiful open two story foyer leading to a private study. The main level also boasts formal living and dining rooms, nine foot ceilings throughout the first floor, well appointed kitchen and breakfast area, huge family room, and main level laundry. Upstairs you will be pleased with three large secondary bedrooms, one with its own full bath. The Master Suite is luxurious in design featuring three walk-in closets, bedroom area and sitting room. Spacious Master Bathroom with double vanity, soaking tub, and separate shower. This model starts at approximately 3,770 sq. ft.